If Brut IPAs are to have a place, Frenchies feels like the kind of place they belong. After all, for a brewery that strives to make marginally left of centre beers with a European twist that go well with food, what could be more appropriate than a Champagne IPA? Brutus is their first effort at this specific kind of beer, though the idea does go back a bit further. Brewer Vince de Soyres reckons this is the kind of thing he had in mind when Frenchies first released its now retired Old World IPA, but it took the emerging trend and a few more reference points to encourage an evolution of the original idea. Staring down at a flute of this wonderfully vibrant beer, you have to say it’s a good thing he came back around. This is super fresh and fruity stuff, the Hallertau Blanc hops having rendered it resplendent with flavours of gooseberry, cantaloupe and the most judicious hint of lime – the effect akin to putting a squeeze of citrus on a salad to give it some zest, to bring it to life. At 8.5 percent ABV it’s pretty robust for such a dainty looking thing and you do feel some of that alcohol warmth, but ultimately that’s of minor consequence as it’s simply no match for the fruity and floral flavours which wash around and linger long. While that all sits on a slightly creamy body – an effect of using oats – it’s the dryness that’s key and which you really feel on the finish. A cursory questioning of Frenchies’ head chef as to his thoughts on the beer suggested it had shot straight to the top of the list of his favourite Frenchies beer to date, followed by enthusiastic musings on how well it would work with so many dishes, seafood in particular. That said, simply knocking it back with a good slab of cheese would be similarly rewarding. 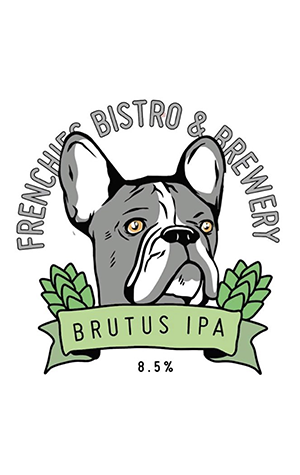 Brut IPAs are still so very few and far between in Australia, but based on this result it would be no surprise to see Brutus become a permanent fixture at Frenchies.